Over the river and through the woods, this sleigh is sure to take your recipient on a flight of fancy! 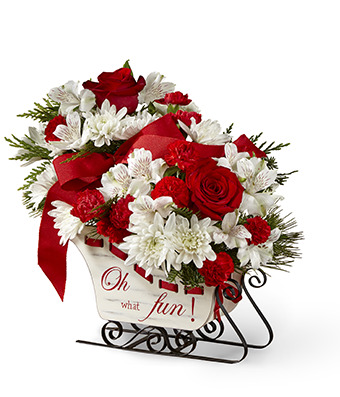 The regular size contains beautiful white alstroemeria, red carnations and mini carnations and white cushion poms or upgrade to the deluxe or premium sizes to swap out the carnations for stunning red roses. Measures approximately 12"H by 9"W.